You can buy individual copies of past print issues of the magazine, based on availability. If you want to buy more than one copy, or back order an issue, please use the contact form. 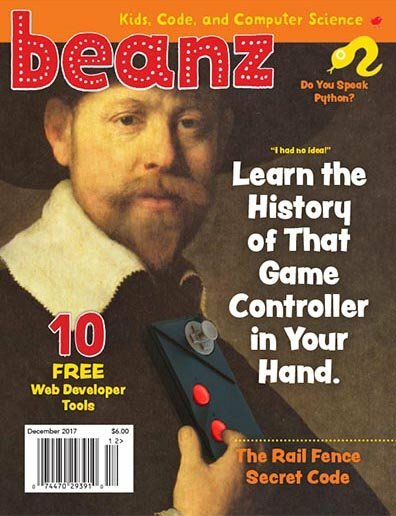 This issue includes the history of game controllers, creating boxes with SketchUp, creating secret codes with a Rail Fence Cipher, the Nether and The End in Minecraft, debugging with your rubber duck, STEAM events, and more. 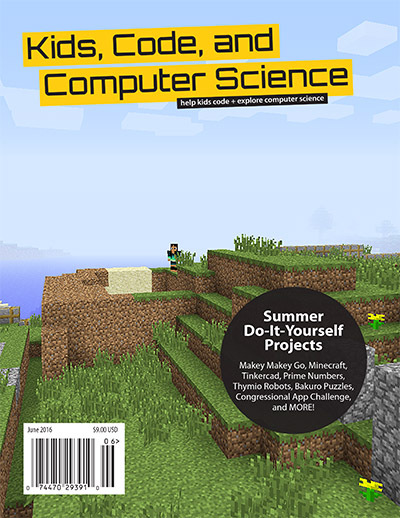 Learn how to use the Minecraft tool box to help survive the game plus Scratch, our STEAM Holiday Gift Guide, LEGO EV3 sensors, secret codes, Python projects, the Uncanny Valley, a coding language based on colors, and more. 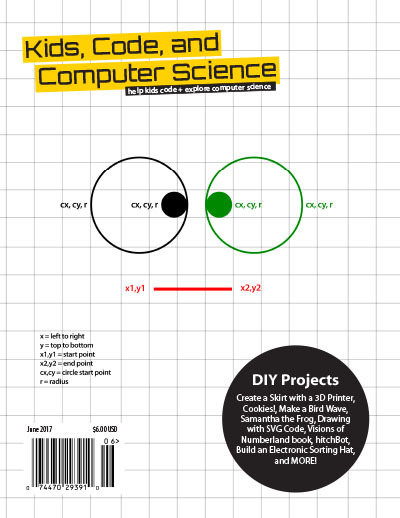 The start of our fifth year of publication introduces a totally new design and name. 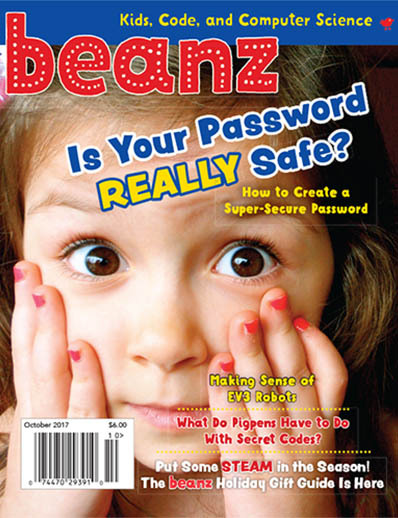 We include articles about secret codes, Minecraft, Scratch, robots, sewing, the birthday paradox, turtles that draw, and more. 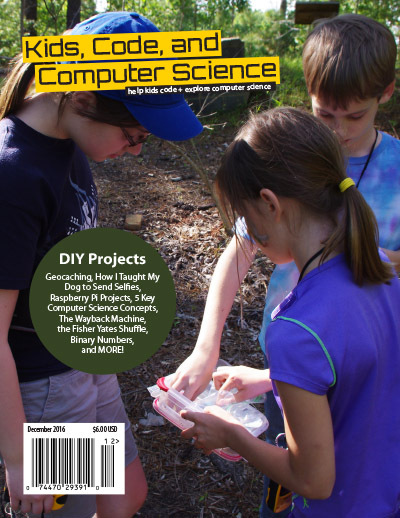 Try out different STEAM projects this summer: there’s pen and paper projects, coding projects, a neat math book (really! ), and ideas for making a dress with a 3D printer. 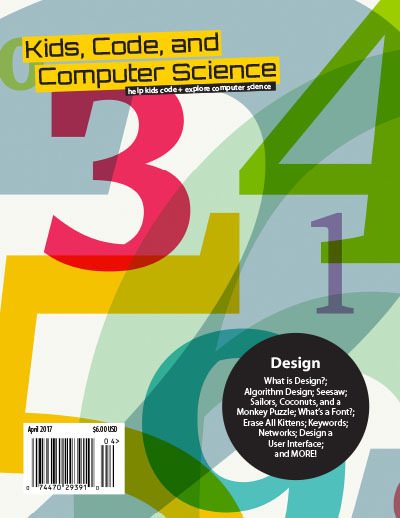 Stories about software that teaches itself, how to design algorithms, what fonts are really, what is design, two well-designed apps Seesaw and Erase All Kittens, a math puzzle about sailors, coconuts, and a monkey, and more. 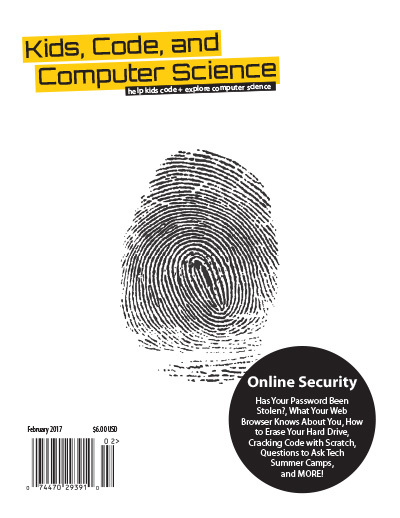 What Does Your Web Browser Know?, Has Your Password Been Stolen?, How to Erase a Hard Drive, Digital Footprints, Create Shapes and Colors with Racket, Scratch Coding Cards, Questions to Ask Tech Summer Camps, and more. How I Taught My Dog to Send Selfies, Binary Numbers, Geocaching, Raspberry Pi, mBot and projects to keep busy over the holidays. 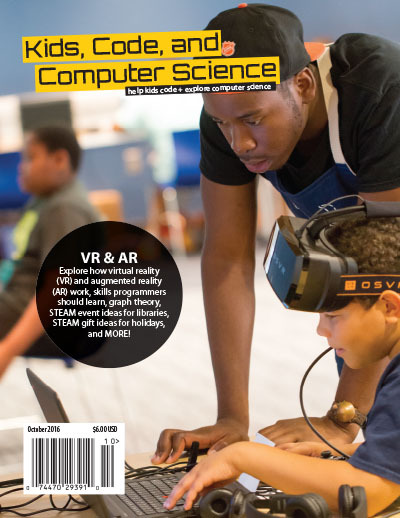 Learn about virtual reality (VR) and augmented reality (AR), as well as STEAM gifts for the holidays. 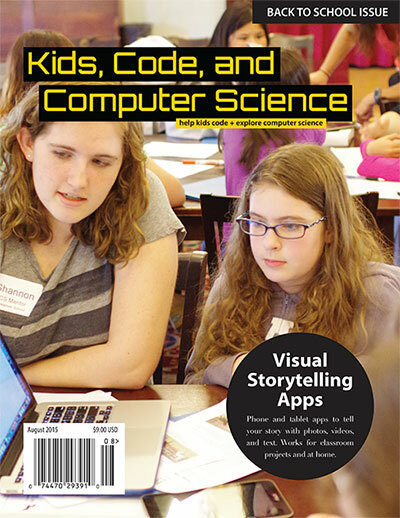 This issue also includes stories about what programmers need to learn, what makes a lousy programmer, graph theory, and more. This issue — our 25th online and 10th in print! 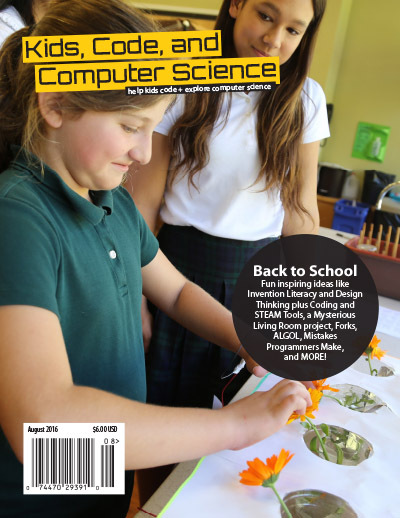 — has computer science, programming, and technology ideas for the new school year: invention literacy, design thinking, makerspace resources, more. 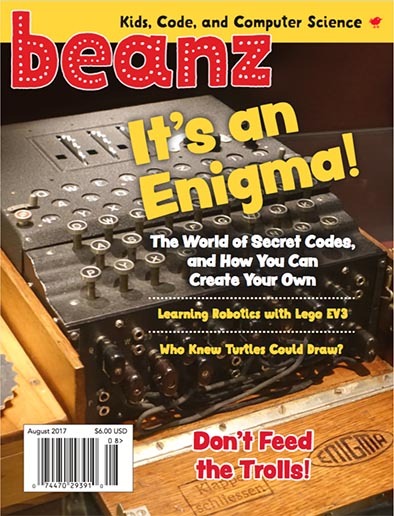 This issue is about projects you might want to explore this summer, for example, Tinkercad, Bakuro binary number puzzles, Makey Makey Go, finding prime numbers, projects for kids ages 5-8, and much more. 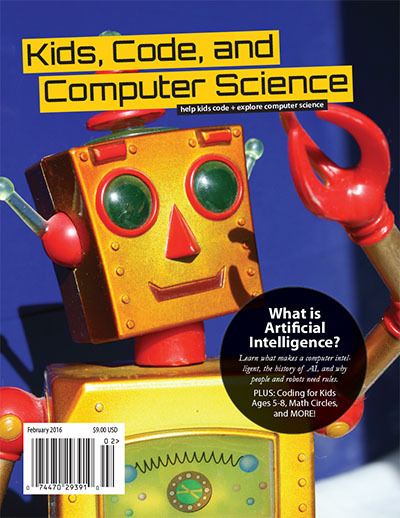 This issue is full of articles about artificial intelligence, coding for kids ages 5-8, math circles, car computers, classic video games, unit testing, IFTTT (If This Then That), and much more. 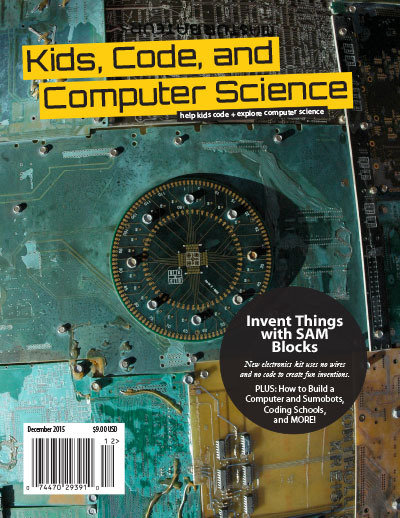 This issue is full of articles about inventing with SAM Lab wireless blocks, build a Sumobot, use a breadboard, build a computer, use low-cost virtual reality headsets, 13th century automatons, find coding schools, create a truly secure password, apps to manage tasks and projects, and much more. Teacher Paul Solarz talks about helping kids learn to learn, how to foster Genius Hour in the classroom, visual storytelling apps, feed a philosopher, single board computers, and more. 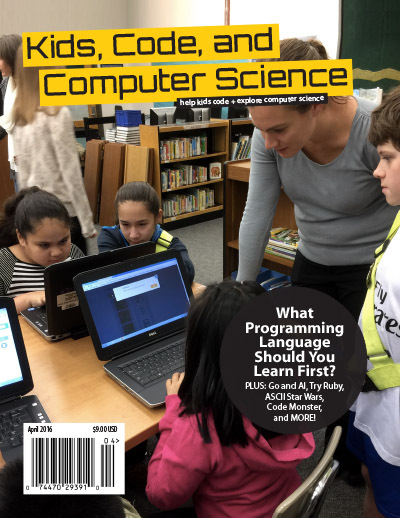 This issue includes articles about how to learn typography, how to create library makerspaces, why people hate Comic Sans, how two people created a fun online game to teach HTML and CSS, online security basics, coding with pen and paper, design patterns, code golf, and more. 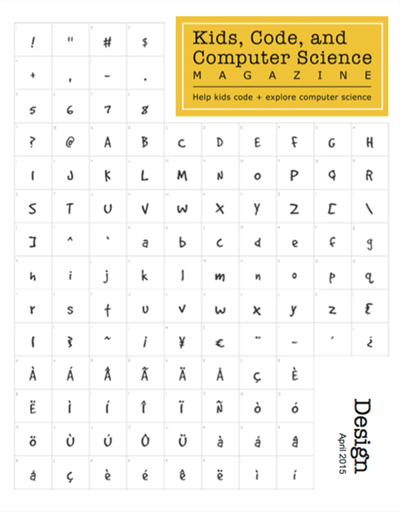 Inside covers include resource URLs for programming languages for education and coding schools. 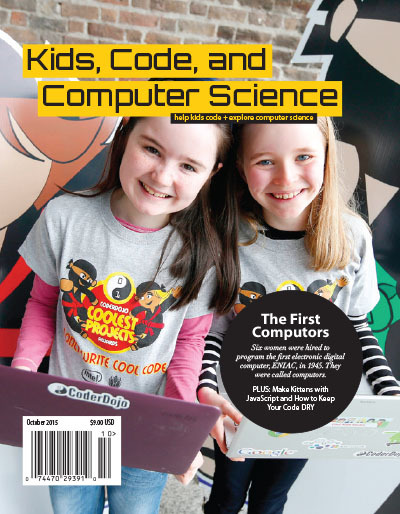 This issue includes articles about 3D printing defined (with a glossary), where to print your 3D models, 3D printers, an interview with Jill Hodges who founded UK tech summer camp FireTech, floating point numbers, VRML, dead programming languages, and more. 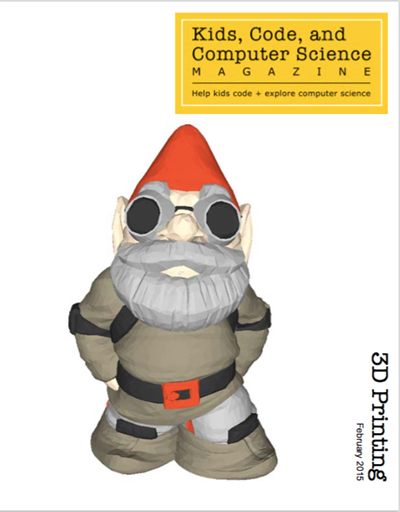 Inside covers include resource URLs for summer technology camps and 3D printers.